Dr Trevor Nicholson, St Vincent’s University Hospital Dublin for his project entitled: Treatment of Muscle Dysfunction with Electrical Muscle Stimulation in Adults with Cystic Fibrosis. 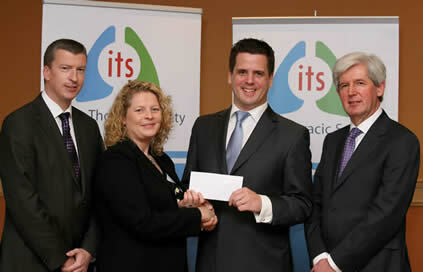 Dr Nicholson pictured receiving his award from Ms Eimear Caslin, Allen & Hanburys. Also pictured are Dr Terry O’Connor, President, the Irish Thoracic Society and Prof Charles Gallagher, Consultant Respiratory Physician, St Vincent’s University Hospital, project supervisor.